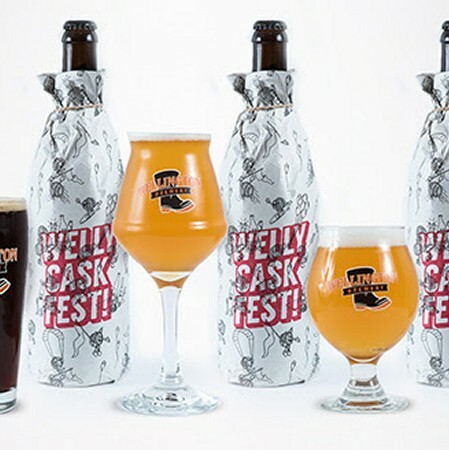 GUELPH, ON – Wellington Brewery has announced that four of the beers brewed especially for this coming weekend’s Welly Cask Fest will be released in limited bottle editions as well as being available on cask at the event. This dark traditional German style lager has roasted malt notes with suggestions of coffee and bitter chocolate, a surprisingly mild body, and a clean, dry finish. This huge double IPA is bursting with vibrant hop notes of pine, citrus, and stone fruit. Clocking in at 9.2% ABV, this hop bomb is dangerously smooth for the punch it packs! Brewed as a collaboration with our pals at Cameron’s Brewing, this refreshing saison is brewed with loads of prickly pear adding a sweet and slightly tart fruit note to this unique saison. The Guelph brew crew – Wellington x Royal City x Escarpment Labs x Brothers x Stonehammer – joined forces to create this one-of-a-kind Trappist inspired ale. This enticing ale has Belgian yeast notes and a balanced sweetness from the addition of local honey and lego candy in place of candi sugar. Yes, lego candy. Bottles of all four beers will go on sale on Saturday September 9th at 12:00 noon exclusively at the Wellington retail store, and will be available there while supplies last.